The #6 stainless steel ball chain spool is one of our most popular, widely used and purchased ball chain spools. 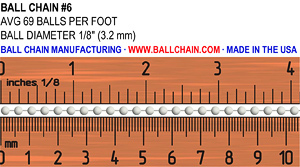 You receive tremendous value by purchasing #6 ball chain in bulk at low factory direct wholesale prices. This chain is used in thousands of applications such as pull chains for lights and ceiling fans, retaining chain for items such as pens(think of your bank), filler and dust caps, tags, NAS parts and assemblies. It is also used for a larger and stronger key chain, neck chain, identification chain, chain for law enforcement badges, etc. The stainless steel material allows this chain to be used where moisture might be a concern. - One of our most popular ball chain sizes and materials. - It is rust and corrosion resistant and suitable for indoor and outdoor applications. - Used as a retaining chain for pens, dust caps, NAS parts and assemblies. - Seen in banks around the world attaching pens to surfaces. - The only ball chain made in the USA. - Manufactured in New York since 1938. I'm very pleased with the quality and service. I will be using the ball chain in mosaic projects so need something that can be used with thin set mortar. This chain is the perfect size and quality. I have used this product to make "flower bud" necklaces for about a year now. Looks great! I use this product to make necklaces. It doesn't tarnish and is very strong. I get excellent reviews on my jewelry. Fast and exactly what it says.